MMO MMORPG News·Articles·Hype Train: Age of Rivals: Kongregate to Steam! Hype Train: Age of Rivals: Kongregate to Steam! Okay, so I’ve spent almost two decades of my life playing CCGs of all sorts. From Wyvern, to Star Wars, Magic to DBZ. 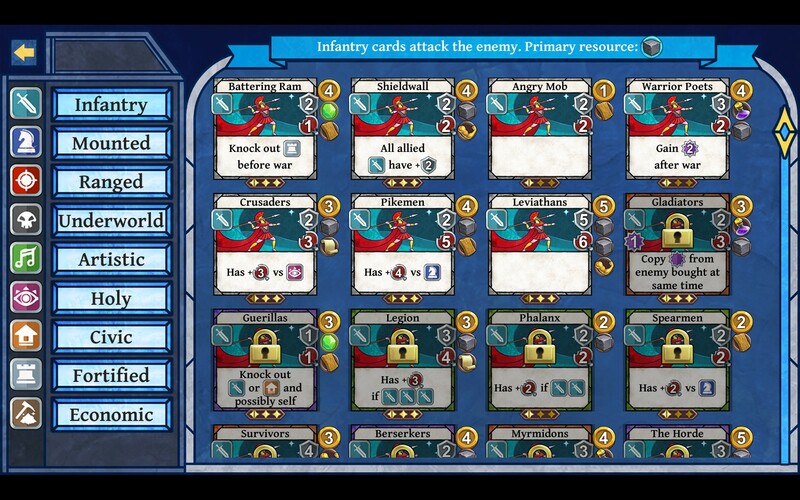 But when I saw that Age of Rivals was part card game, part board game, I was pretty excited. I just figured I’d go in and start wrecking everything, because I’ve played a lot of card games. However, this is not a card game in that same vein. It’s more like. . . Civilization and Settlers of Catan meets Magic. You do have decks of cards, factions [in the form of characters] that have a guaranteed card, and your goal is to conquer the other player through word and deed! 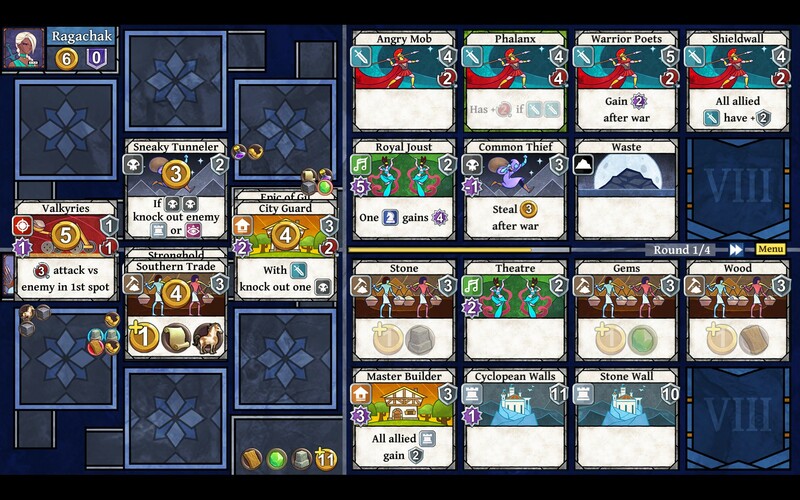 It’s also reminiscent of 7 Wonders, and that’s pretty good to me. Your goal is to score the most points over the course of four rounds, and each round has a set of phases you go through. Though no matter if you’re playing against the computer, or against other players, each game will probably play differently. All of mine have! I’ve enjoyed playing against the computer, and that’s a pretty rare thing for me. Generally in this kind of situation, the NPC controlled side is terrible. They typically don’t play to win, but in Age of Rivals, they definitely do! The phases are as follows: Build, Conquest, War, Score, End. In the final round, you combine your eight best cards to make one final run at the opposition. In Build you can Gold based on income, spend gold for new cards, and leftovergold gives you points. Conquest is when you attack other cities to gain territory. 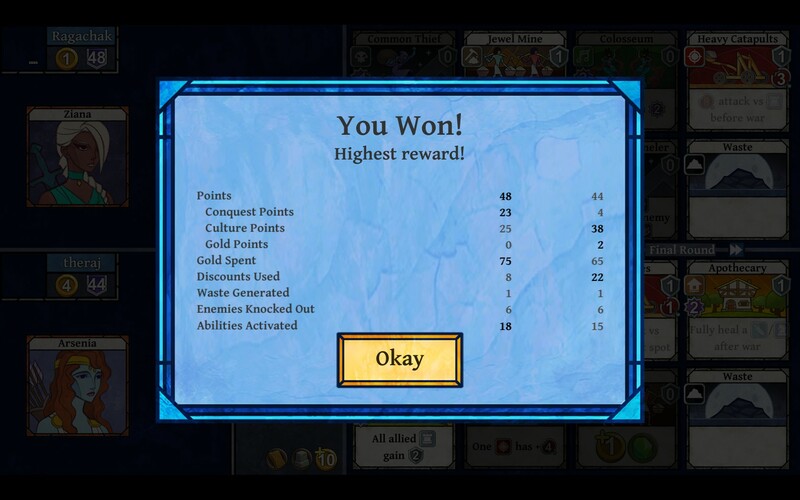 Conquering cities gives gold and points! You want both of these. War pits you against each other, destroying units, buildings, amassing points. Score is… well, when the Score is tallied for that round, and End kind of speaks for itself. Round’s over, a Knocked Out card is randomly Ruined [lose stats and abilities permanently], and the other KOed cards come back with one less Armor. Also four random cards you played come back! As you play the game, you’re building a city, one to last the ages. Or at least, one to last this beating by the other player. You really have to decide on what cards matter to you the most, if you want to build for more gold, a bigger army, more defensive structures, etc. And you can’t even rely on just your cards, that’s the thing! After you’ve picked a card to play, paid the cost, you swap hands with your opponent and play something. That really changes how you would approach a board game when you have to hope your opponent has a good hand. I never thought I’d say that before! You can, of course, get more card packs to get better cards, in the shop. You can get them through gold [completing quests, etc] and not through money. I do not see any way to spend money on the game, so it boils down to having the skill and being able to get quests done in a timely manner to get that 100 gold. Since this is a card game in addition to a board game, there are definitely elements of chaos, and having a high-risk high-reward attitude can really get you ahead in the game. There are cards with randomness to them [destroying a random card, buffing a random card], and again, having to rely on the cards a foe brings to the proverbial table, but if you are willing to gamble, the payday could be completely game changing. I also appreciate that you can’t take/get your Guaranteed Card taken by your opponent. If you don’t play it yourself, a random card goes in its place. 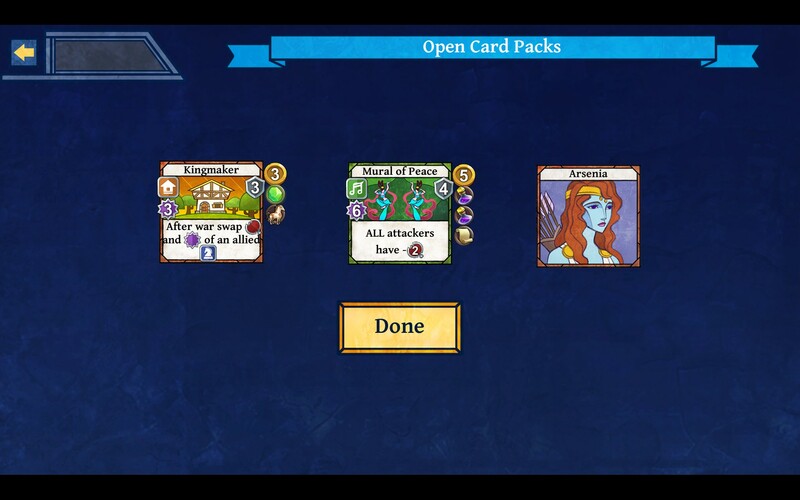 There are so many things to be aware of, to know when playing Age of Rivals, so if you don’t play the tutorial and pay mind to it, and read everything! Juggling when to play soldiers, getting resources, or making sure you have enough gold or points to stay in the game, that’s all very important. It’s also important to find the Rival that you enjoy the most, or at least has the Guaranteed cards that you want to utilize. Each one has a different card all bring something else to the game. I enjoy Age of Rivals, because I love board games, and this one should only take about fifteen minutes or so per playthrough. It’s not going to take my whole afternoon just to get a match or two in. I do wish the cards had more variety in the artwork but that’s not a game-changer. But it is a little annoying! It’s sort of slow to start in getting cards, but you can’t spend money on it! I love that idea, that while it only has about 200~ or so cards, and 12 characters, you can unlock everything in a pretty expeditious fashion. I do feel that it can be incredibly hard to come back if you run out of gold on a bad play or simply get wrecked in the battle phase. If you’re really behind, the opponent will probably get two out of the three castles during the “War” phase, leaving you with just one, and quite a fewer amount of points. Once you’re behind a few rounds, it gets harder and harder to make a comeback, and I’ve even been smacked down by the NPCs. It’s not impossible though, I was winning a game until the final round where they came back out of nowhere. They didn’t win, but they sure tried! That’s not a sleight; instead, it’s a salute to the devs to making pretty clever AI. I was admittedly hoping for more of a boost in content between the Kongregate and Steam editions, but being able to just play for fun and unlock cards at my own rate instead of feeling obliged to spend money? Love it! If you’re looking for a fun, challenging board game to play on your own or with a friend online for a few minutes, this is the one for you! It epitomizes “Easy to learn, Hard to master”! I left a few things out, how-tos for the game, but you will have to learn those yourself! It seems a little like Hearthstone, don’t you think? Not even a little bit. It has building materials, units, defensive structures, no health pool for the player, a scoring system. I don’t think it’s remotely like Hearthstone, except that it has cards. And you are forced to use cards your opponent doesn’t use. It’s definitely more of a board game style than a CCG like Hearthstone. It’s more of a civilization-style game, what with structures, improvements, stuff like that.